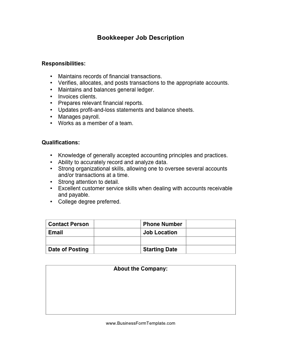 Major duties and necessary qualifications are covered for new hires or updated employee requirements in this bookkeeper job description. Maintains records of financial transactions. Verifies, allocates, and posts transactions to the appropriate accounts. Maintains and balances general ledger. Updates profit-and-loss statements and balance sheets. Works as a member of a team. Knowledge of generally accepted accounting principles and practices. Ability to accurately record and analyze data. Strong organizational skills, allowing one to oversee several accounts and/or transactions at a time. Excellent customer service skills when dealing with accounts receivable and payable.